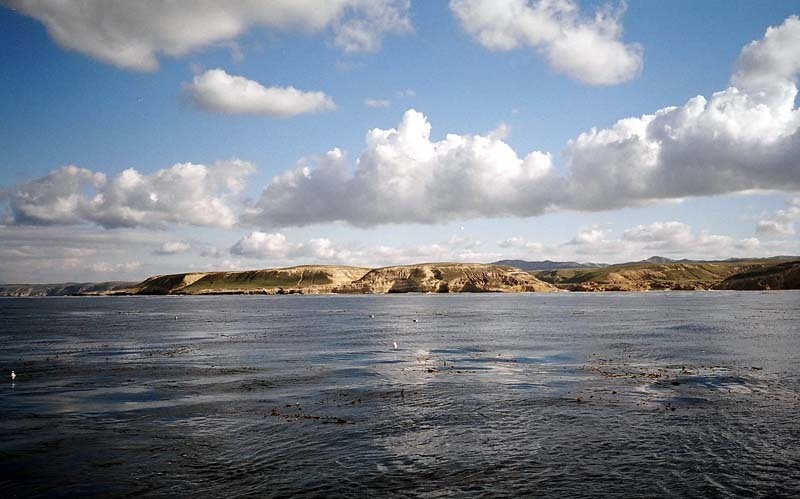 About 32 miles out from Santa Barbara, Santa Rosa Island is sort of a 20 mile square with its corners aligned to the compass. In ways it was just another day of diving, but then again that doesn't mean it wasn't special. It was a calm sunny day with a bit of ground swell. It was warm without any noticeable wind. That is nice which isn't so memorable, but this was at Talcott Shoal, wind central, so it was unusual. This is the side of the square pointing North West. There is nothing in the way between Talcott and Alaska so the average wind speed there is 28 knots all year long. It's pretty unusual for it to be this calm and like my last trip there, the next day could be expected to be howling wind with angry seas. 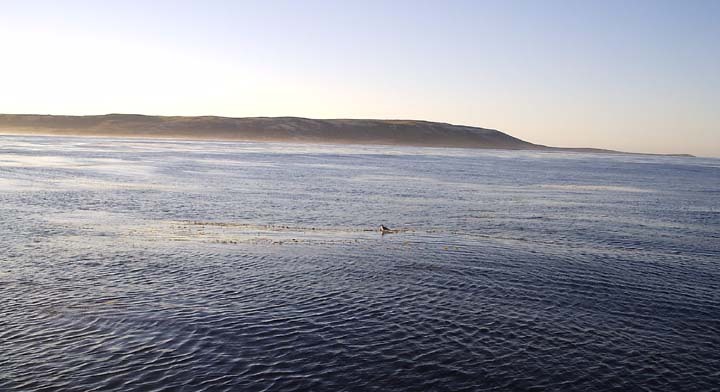 Huge kelp beds go all the way to the West end of Santa Rosa Island and it is all divable. What does make Talcott special is the wide open diving. A long shore may provide a fair amount of diving, but this is an area where the shore drops off very slowly to deeper than you want to dive. Since you can often dive more than a mile offshore, literally there are many square miles of excellent diving here. Talcott Shoal offers more diving on the north west side of Santa Rosa Island than most fifty miles of diving anywhere else. As a bonus, the geology of the bottom makes it very difficult to get lost. It all runs in straight lines parallel to the island. The life is incredibly diverse. I looked in a hole and this guy and his buddy shot into it like there was something there. I started this trip with some hesitation since I have had some minor health issues that were catching up with me, but I had to get in a good dive. I just don't do that enough these days. I wasn't sure how it was going to go, but I was determined to dive. I really wasn't seriously hoping to get to Talcott, but anywhere at the Northern Channel Islands would be some great diving. Just where was the weather going to be? I had gotten to Santa Barbara at a decent time the night before, 0Dark:30, though I was disappointed that I was to late to stop in Ventura to visit all the folks I knew going out on the Peace for the Sea Diver's trip. It was cold at the dock with a minor, but biting wind. For a while I talked to Ken and Martha who were photographers. It sounded like they had dove and photographed just about everywhere. When I went below I was tired enough that the bunk felt quite comfortable. Though I woke when the engines started I was right back asleep and never felt it when we left the harbor. That was a good start. 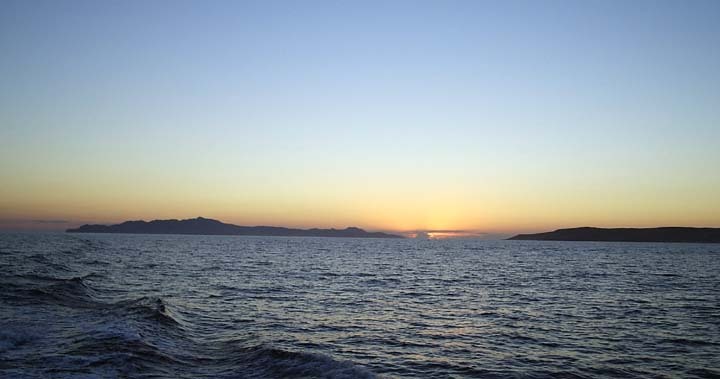 I woke again at 0Child:30 and watched a beautiful sunrise between Santa Cruz Island and Santa Rosa Island over calm waters. It looked like we were heading all the way to the west end of Talcott, nearly at the extreme west end of Santa Rosa Island. I got my gear assembled, put film and batteries in cameras and then got my wetsuit on. There were only 20 people on the boat with is very comfortable for the Truth. There were 5 or so photographers and the rest of the divers were basically after lobster. I talked to Ken and Martha more as we motored along. They sounded like UW photog nuts and had some very nice camera gear that still probably wouldn't have been enough for me to get good shots. I knew a few divers from past dives and Dan from his reputation as a lobster diving nut. It seemed like a very friendly crowd. I actually watched two sunrises. The first was over the ocean between the islands and the second was after we had traveled on some and the sun rose from behind Santa Rosa island. San Miguel Island was a bit farther on. 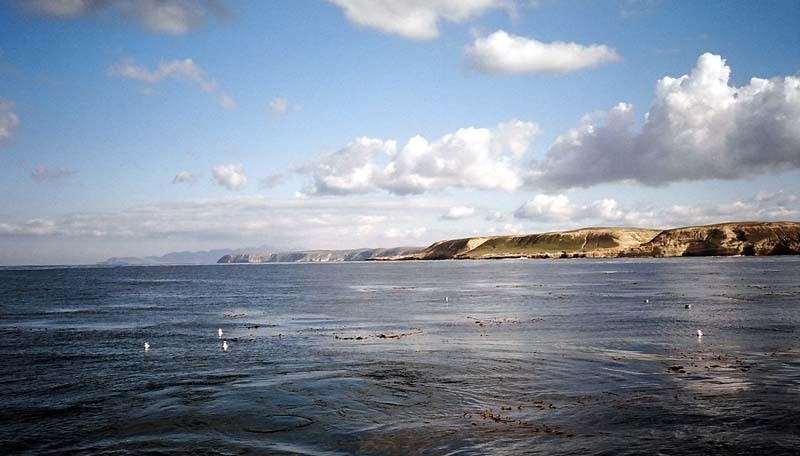 San Miguel Island is even more exotic and more remote. A DM gave a briefing on the dive spot. I mentioned to him that I didn't expect to have trouble with my knee, but it might happen. We planned a slight modification on signals if I wanted pickup. Talk about unorganized, but that is how it goes when you don't dive regularly enough. I found out that my small day light had been left on. Note to self, bring extra batteries for that one too in the future. I geared up and found that my BC hose wasn't interested in attaching to my wing. I'll have to figure that out. I finally got it together and did a sort of a giant stride, but I still just turned over and went down. Vis looked nice and as I went down I had no problem from my other concern, a wisdom tooth that had been having problems, but none right now. I hit the bottom running. Though it wasn't crowded, I did my standard procedure at Talcott and headed fast away from the boat at a diagonal from the island. The idea is to find a ridge beyond where anyone else would go, follow it away from the boat for half a tank, then head back so that I would be in front of the boat and head back towards it along another ridge. I would cover the maximum area that no one else had covered and presumably surface right in front of the boat. The ridges can be 20 feet apart or 150 feet. They may be 4 inches high or stick up 12 feet. There may be ledges and there may be bugs. 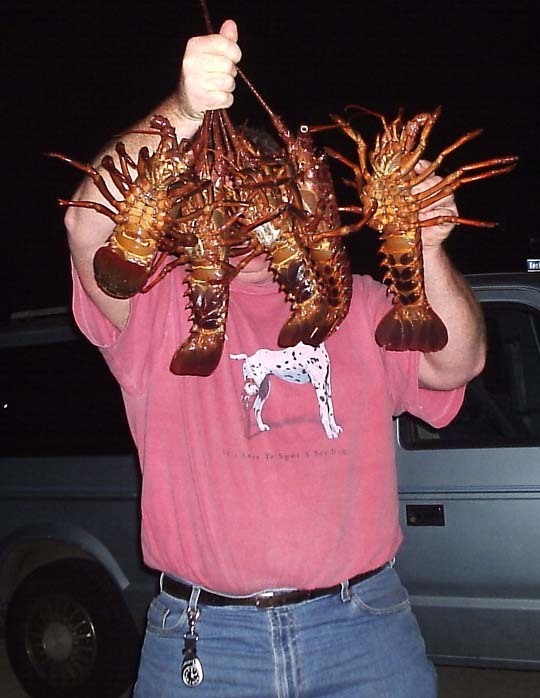 5 pounder lobsters are still fairly common here and last time I got out here Peter had taken a 12 pounder. It's one of the best places to find big bugs. You never know. You never know what you are going to see. 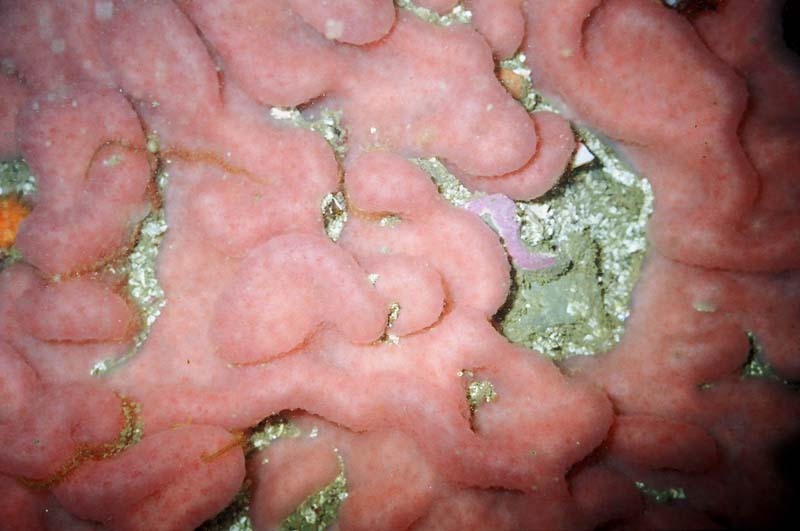 The other sea life out here can be amazing too. I was traveling over very nice terrain at about 70 feet with a lot of boulders and ridges. There were plenty of fish and the rock bottom is covered with small orange anemones and small purple urchins every few inches. There is lots of other small life, but I was hunting more than site seeing. I found a nice ridge to follow that stuck up between 2 and 4 feet. The side towards the island is a ledge under rock layers that have tilted up and the back is just a gentle slope of rock. There are lots of sand channels between the ridges. While there were lots of large kelp plants, they are spread out in such a large area that most palces the kelp was not really thick at all. Corynactus colors are my favorite. I got to one nice rock overhang that had 4 or 5 short lobster in it and stopped to take a picture. 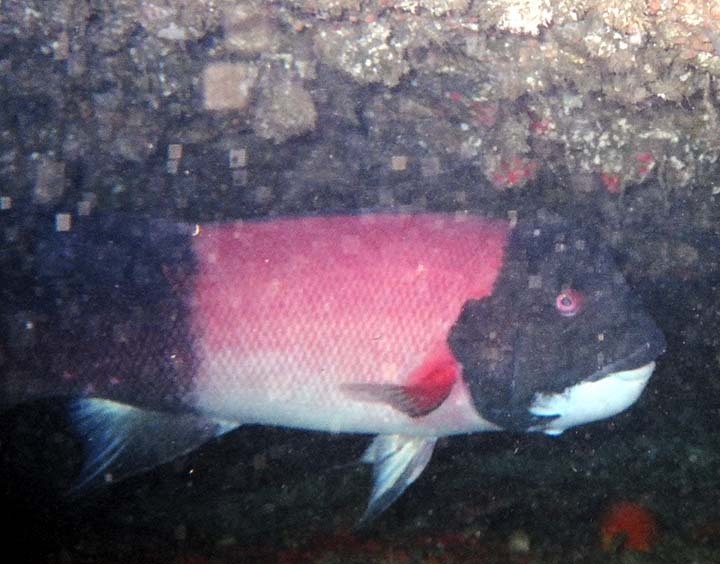 Two large sheepheads came up and went into the shelf as well. They nicely posed and I took a couple pictures of some macro stuff growing as well. 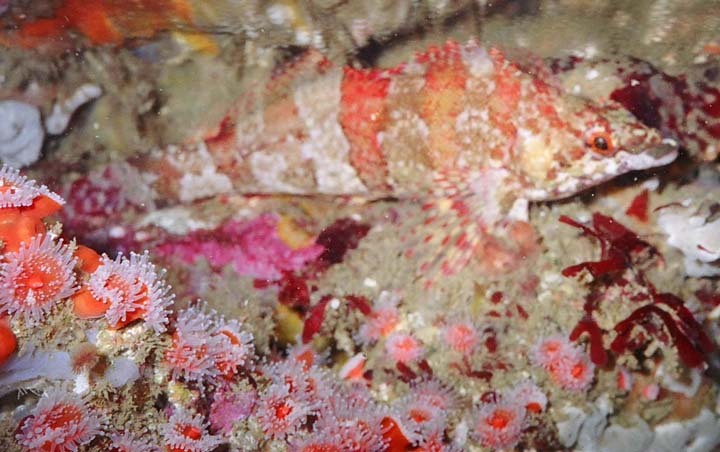 I saw a few young lingcod that had lost their juvenile colors. There was a definite surge, but not bad and the ledge could be used for protection. Mostly though I just used the surge to power me along. Hold on when it is against you and push off when it changes direction. 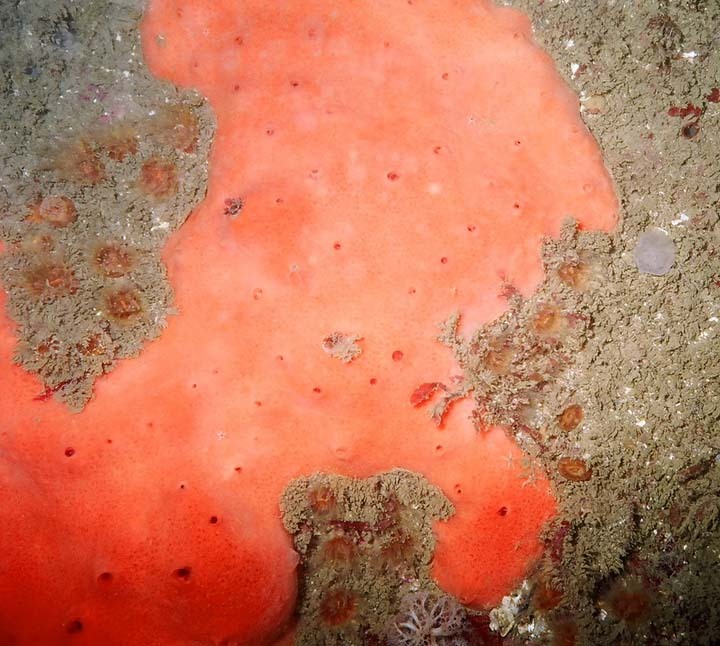 While not as spectacular as some places, there were nice growths of very colorful red Corynactis and lots of orange sponges. I came to a rock with a nice sized bug peaking out from it. He had a backdoor, but it was still a lousy choice of a hole and I had no trouble pinning him. 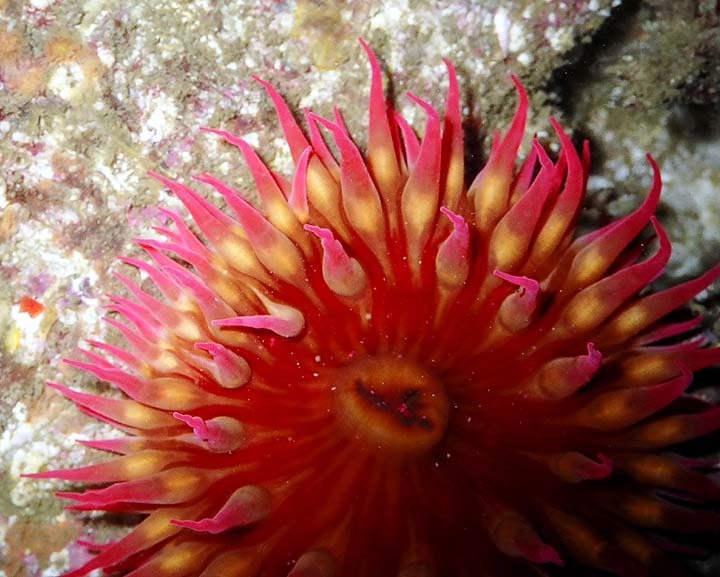 There was a ton of life including lots of fish, purple urchins, large red urchins, feather duster worms, tunicates, big grey sponges and others. I think I see more now after looking at peoples pictures on the BBS. They focus on different things than I normally notice, but now I notice more of what are in their pictures. There is tons of vivid color. I kept moving and made my turn back to the boat. I started up and tried to figure out what the latest info on deco stops told me to do. I stopped at about 30 feet for a couple minutes and then made a stop at 15 feet. Nicely I was about 50 feet in front of the boat. While I quit bothering to navigate to the boat at dives end, I can usually still do it if I want. The morning was getting brighter and the sky was clear with a few clouds that only hinted at what was coming. The water was coppery blue looking across the kelp beds at the island. The island itself wore a cloak of brilliant green from the grasses that had grown since the first rains of the season. It's beautifully rugged, but invitingly green. I had a good breakfast and got a nice 3500 psi fill. The boat moved a bit to the east. This time I did a tiny stride and went straight down to 60 feet. Vis was again between 20 and 30 feet. I moved fast and found a ridge. This dive was a bit different. I didn't see any large sheepheads, but I saw lots of rock fish including kelp rockfish, gopher rockfish, a vermillion rockfish, what I think was a copper rock fish and some others I didn't recognise. On all dives I saw tree fish. While most of the time I was looking for lobster under the ledges, in places the ledges had broken down and left small boulder fields. Those are a good place to look. I saw some antennas under a microwave sized rock. One bug was visible and clearly short. The other looked bigger. I jammed my arm in and got a hold of what I figured was the small one, but I pulled out one that was plenty legal. I felt around for the other one, but it was obviously a short. I found another legal in a ledge a bit later, but I never got a chance to try the lobster grabbing trick that Mel had told me about. I was taking pictures whenever I saw things of interest. 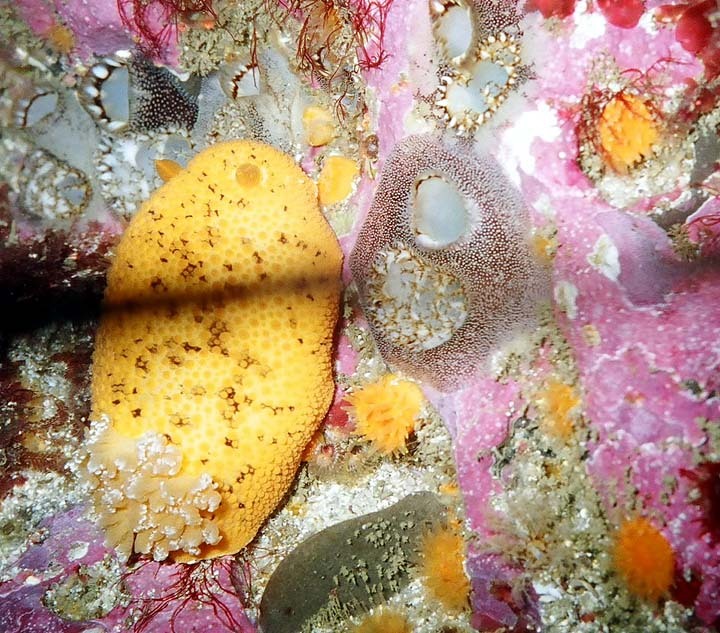 There were occasional large nudibranchs. The diversity of life here is amazing. There isn't all that many of most species, but there sure are a lot of different ones. I also picked up a couple big scallops I saw for sashimi. The ledges tend to be pretty full of large red urchins, but there is plenty of room for everything else. As you go along a ledge, it's height changes. Sometimes the ledge sticks out 8 or 10 feet just a couple feet off the bottom. Usually it is sand below it so there are no lobster. If there are broken rocks under it though there may well be bugs. Good luck getting to them. Again I came up about 50 feet in front of the boat. Really the next dive was almost identical. I was just moving fast and grabbed a couple bugs and a couple pictures. At one point I was going along a great looking ridge full of hiding holes, but I saw a pair of blue fins right ahead of me and I headed straight out, post haste. It turned out that the diver was Dan and right after that he found some lobster with a back door and could have used some help with. 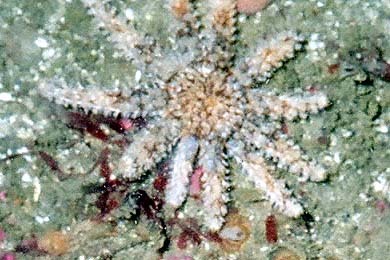 Small Sun Star will be the terror of the reef when more mature. The last dive was different. We had gone a bit east and the skipper said it was 50 to 60 feet. All directions look similar when inside a kelp bed at Talcott. They sort of go on forever. Towards shore from the boat this time was lots of kelp and a bunch of trap floats so I wondered what was there. Probably there was a good rock pile. I decided to go in towards the island instead of out. I expected to see some good terrain. I hopped in and vis looked the same... until I got to 30 feet and it went to murk. From there it went to pea soup. That's OK for lobster hunting, but I wished I had a working light. It was pretty dark. Part of my plan on this dive was to pick up some urchins to go with the scallops. Well, if I had room in my bag for them and all the bugs. There were no obvious rock piles. As a matter of fact, it was more flat rock than I had seen in the previous dives. I didn't mind the vis, though it was mostly in the area of 5 feet, because it may not effect the lobster diving at all. Actually, if it is dark enough, the bugs even seem to come out of their holes some. The surge was a fair amount stronger here. I was having fun riding it. When it is against you, hold on to the base of some kelp, a boulder or any tiny crack in the flat rock. When it shifts forward pull off hard and start finning with it. You fly across the reef as much as 30 feet or so in one surge. I like a challenging dive and this was one. Again I wished I had a light, but really the bugs are going to be in sight, if only barely. I looked in a crack and one came out to investigate me. It was short. I found some others in a shelf. One looked to be 2 pounds easily. It was a shallow shelf that went in deep and the lobsters were wary. I made a grab at the big one, but it was just too tight and they were invisible once they moved 6 inches back. I grabbed in for a feel, but the shelf might have gone in 10 feet for all I know. It was sort of sad though. As I said, I was looking for some urchins. I just wanted 2. You don't need huge ones to get roe. 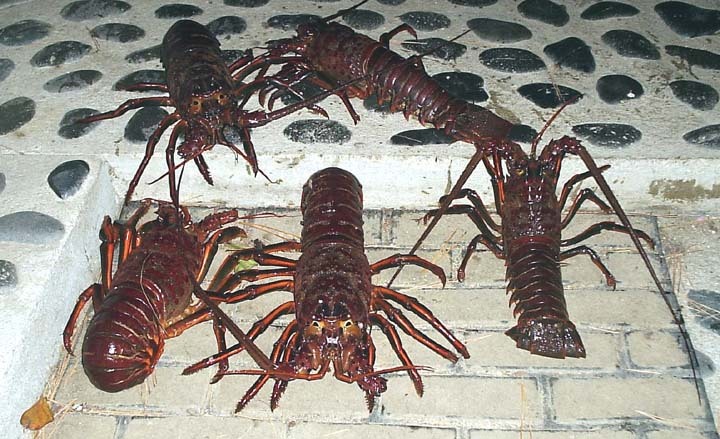 Actually, the mid sized ones are probably best with a test (the ball within the spines) about 4 inches in diameter. I wasn't finding any. 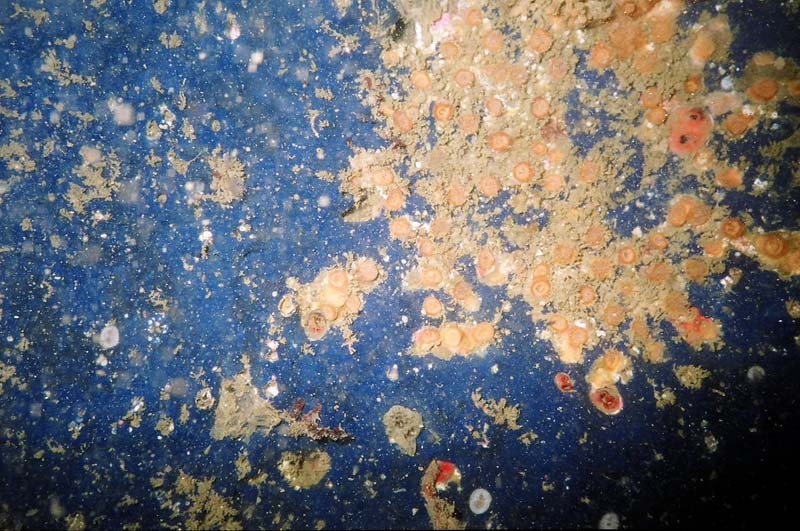 I found lots of small red urchins and some purple ones lining along all the crevises of every ledge, but all were too small to take. As I went along ledge after ledge, I could see that the rocks surfaces from top to bottom all had the rounded craters ground in from the large urchins that were here not so long ago. 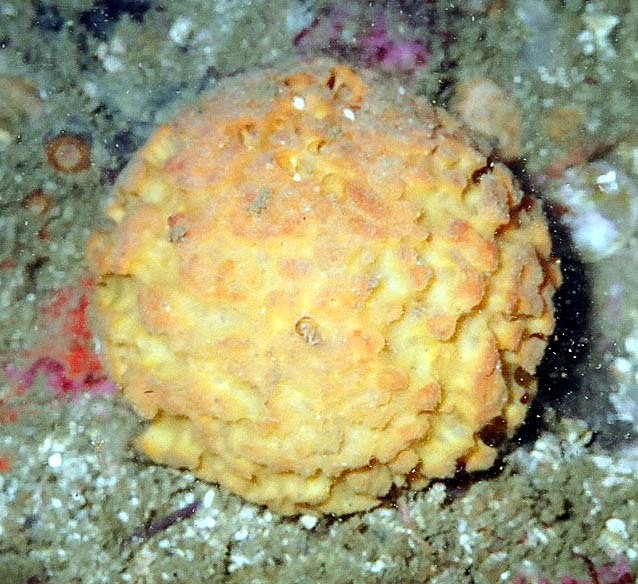 Over years, the bottom spines of the urchins were used to grind softball sized protective holes in the rock. The urchin harvesters had been here. Underneath those mature urchins is a critical protected nursery for the young of many species. 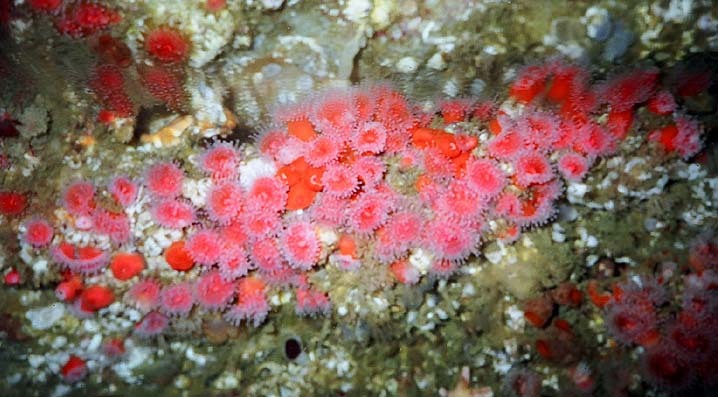 The loss of the urchins signaled the loss of much of the environment and ecology of the reef. While there was still a tremendous amount of life, there was far less than there once was. 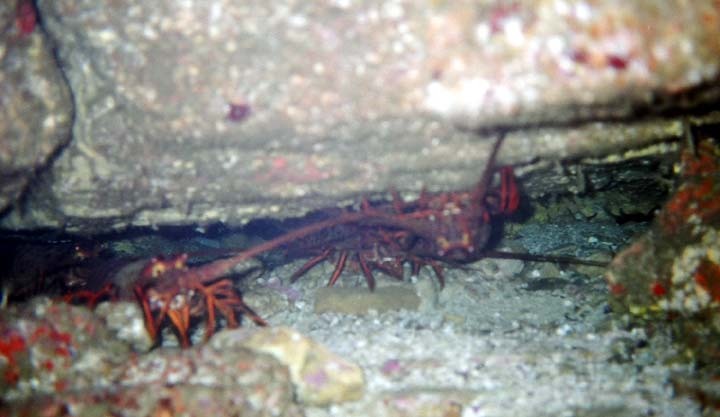 I knew my air was low but I found a couple red urchins under a ledge that were about big enough to be worth taking for roe. I worked one some with my hand, but couldn't get it loose. I made a quick decision that I would need to get my iron from my bag, but I glanced at my gauges and figured it was time to get while there was a bit of air left. This time I came up way away from the boat. As I swam back, I put some kelp fronds in my goody bag to put over the lobsters in the ice chest to keep them fresh. The inflatable chase boat came out and offered me a ride, but I decided to swim in the last ways rather than go through the hassle of getting off gear and getting it in the boat. It was a dumb call, probably based on fatigue. Worse yet, I was the last one on the boat, but it was a pretty swim through the thick kelp. Heading home along Santa Rosa Island towards Santa Cruz Island. Really, I think that most of the lobsters were in a bit deeper water walking in front of the storm. It was a great day of diving. Now it was time for a warm shower, stash the gear and get a good lunch from the galley. The trip back was through calm waters on a beautiful day. There is no fresher air than what you get standing at the bow rail watching the clouds and waves. 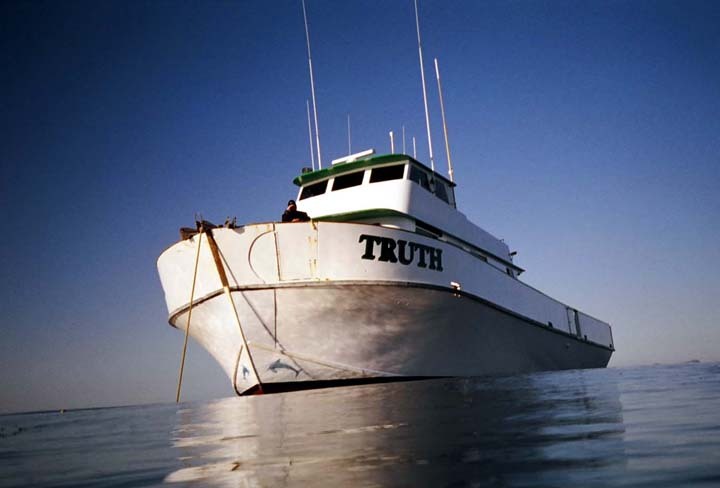 As usual, it was a great trip aboard the Truth Dive Boat. They're nice bugs, but they look smaller when I hold them. 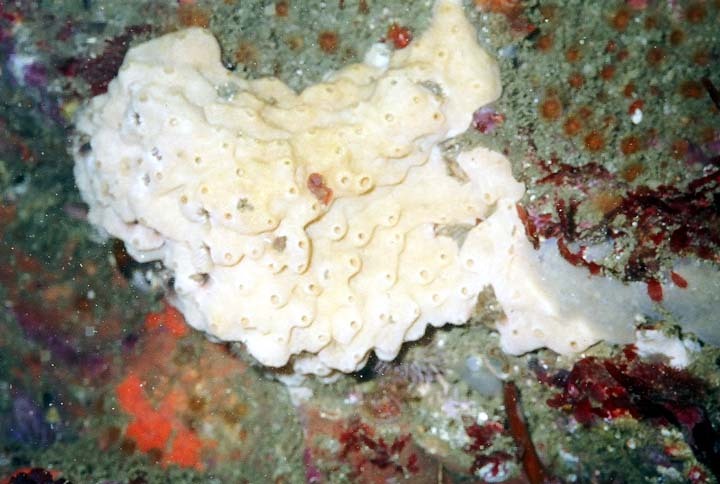 I saw a number of sponges. I keep trying for a good shot of a Cobolt Sponge.